Given that the most exciting item in the LookFantastic Beauty Box for July 2017 arrived all smashed up, I decided not to do a video unboxing. This box contained an excellent curation of products, but was spoilt entirely by the vagaries of the postal system. Ah well, the perils of shipping makeup. 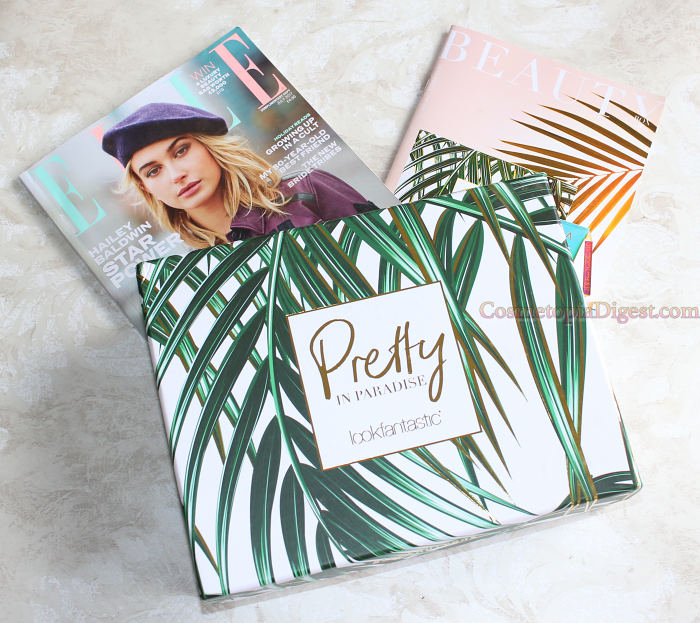 The July 2017 LookFantastic Beauty Box is themed Pretty In Paradise. The box is stunning, and comes with the Elle UK magazine for this month, as well as the in-house booklet. 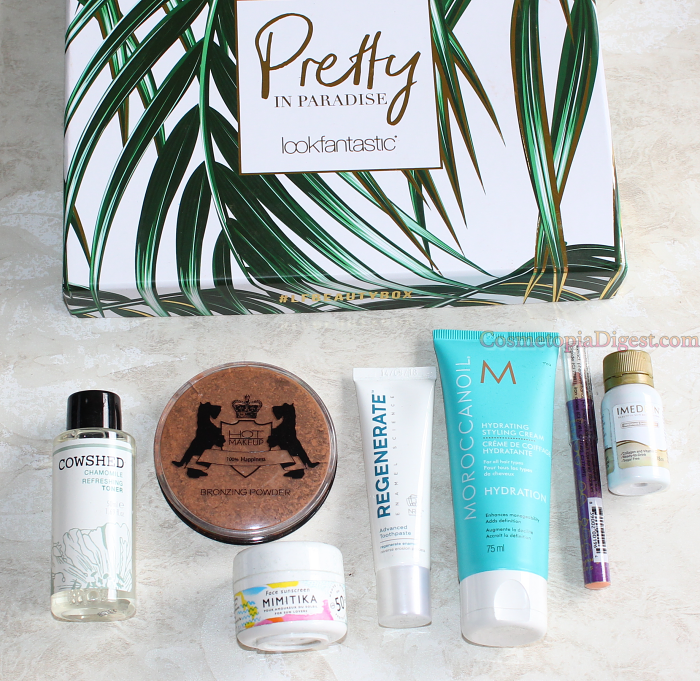 Scroll down for the contents of the LookFantastic Beauty Box July 2017. A spritz-on hydrating toner that is ideal for cooling you down in the Summer. It feels light and fresh on the face and is perfect for sultry and humid weather. Goes into my travel bag. I've heard lovely things about this French brand. Why is it that French pharmacy brands such as La Roche Posay, Caudalie, Nuxe, Vichy, Eucerin and so on are SO good? Also goes into my travel bag, as it's a neat little pot. 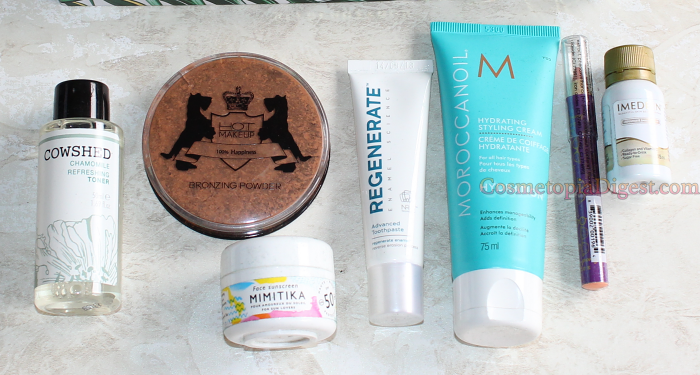 Being a huge fan of the quick-drying Moroccanoil, I was excited about this. Sadly, it turns me into Severus Snape, even when I use only the merest smidgen. While I love the character, I don't want to LOOK like him, thank you! This promises to regenerate enamel! That sounds great - tetracycline through the major part of 2016 has ruined my teef, particularly on the lower jaw. Despite my not being a fan of receiving toothpaste in beauty boxes, I like the idea of getting back my good teeth. I'll start this once I get back from vacay, and really hope it does what it says! This claims to be a "4-in-1 wonder product", which serves as illuminator, waterliner, concealer, and base." The pencil format is not a good idea for my acne-scarred, traumatised skin. Goes into my giveaway box. The disaster. This one came all smashed up in the post. I've told LookFantastic, who have promised to send out a replacement. I love my bronzer, so I hope it arrives quickly! Blimey, another supplement. While I completely believe in a healthy diet and lifestyle, and take my fair share of supplements (particularly calcium and Vit C), I'm leery at taking something that came in a beauty box - without my GP's approval. So I really wish they would lay off the supplements. Even a black eye pencil or a lip gloss would be preferred to an oral health supplement; it is a beauty box after all, and I can probably give it away or something. Out of six products, I did not like one, and another came in all broken. This is a comme ci comme ça box for me. I love the Cowshed toner, and am excited about the enamel-regenerator and the sunscreen. Apart from those three products, the rest of the box was a bit underwhelming this month. The design of the box itself is pretty, yes. I hope next month is a lot more promising. It should be a Summer-special, or Bank Holiday box, and I hope there are no vitamins or supplements - or black eye pencils! LookFantastic ships worldwide - go here to subscribe. A box costs £15; long-term subscriptions bring it down to £13 a month, and you do not have to pre-pay. I'm excited for their anniversary box in September, and for their usual Christmas run-up series from October - stay tuned for unboxings!